LG Preparing Fitbit-Like Wearable Gadget? LG has admitted it is preparing to release its first wearable device for consumers, and we just got a look at what it might be, a Fitbit-style gadget called the LG Lifeband Touch. That’s according to regular tipster Evleaks, who posted a render of the device to Twitter. We understand that the Lifeband Touch will support both iOS and Android, and sync with LG’s existing fitness app, but it’s not clear when it will be officially unveiled — CES seems like a good bet. 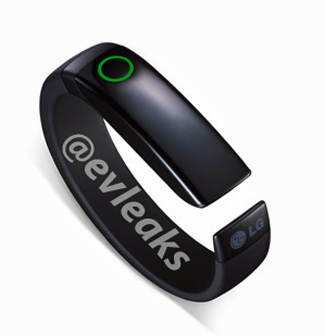 The device appears different to the Smart Activity Tracker that LG showed off at CES 2013 — we’ve contacted the company to see if it has any details to share at this point. We hear also that the gadget will comprise of a touch-based OLED display, accelerometer, altitude meter, and music player that controls tracks from a paired device.